I wanted to make a water-based nomad map. Lake nomad is an RMS that features randomly placed lands and islands. 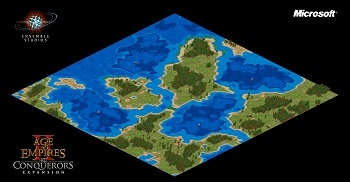 Players start in the middle of a lake (or the ocean) with 3 villagers, a scout and a transport ship. Your units are standing in the water and need to be loaded onto the transport ship first before you can drop them off somewhere. Will you start building immediately or look around for the best site to start your settlement? If you are not using the HD Edition or the UserPatch, you should select high starting resources if you want to be able to build a town center without first having to collect wood. This is not necessary in the HD Edition or with the UP. The standard AI can't play the MP map because it requires the transport of villagers. However, I have created a single-player version of this map in which all players except player 1 start on shallows which are connected to the mainland. This means that any land-nomad capable AI should be able to play the SP version. The HD Edition AI can play this map while the old Conquerors AI cannot. If you are not using the HD Edition, you will need to download a suitable AI (ie. one that can play land nomad maps) from the Blacksmith. As always feedback is welcome - are there the right amount of resources on this map? Is there enough building space? "AI's can't play this map because it requires the transport of villagers :/ "
True, with the userpatch it's possible for an AI to do that though. So you may have good chances when requesting a version of an existing UP AI which transports its villagers to the mainland on this map. Cool, I didn't realize that the Userpatch added that capability! How you captured the screenshot? I've added a single-player version of this map, which should be playable by any AI that can play land nomad maps.